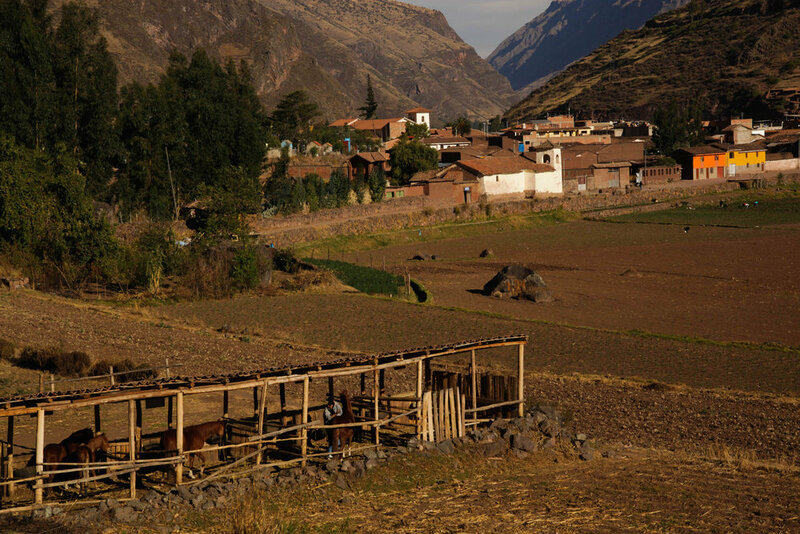 Getting to the small Andean mountain town of Pisac (Peru) from New Zealand took several days. First up there was the eleven hour flight from Auckland (NZ) to Santiago, a night in that city, then another flight to La Paz in Bolivia. 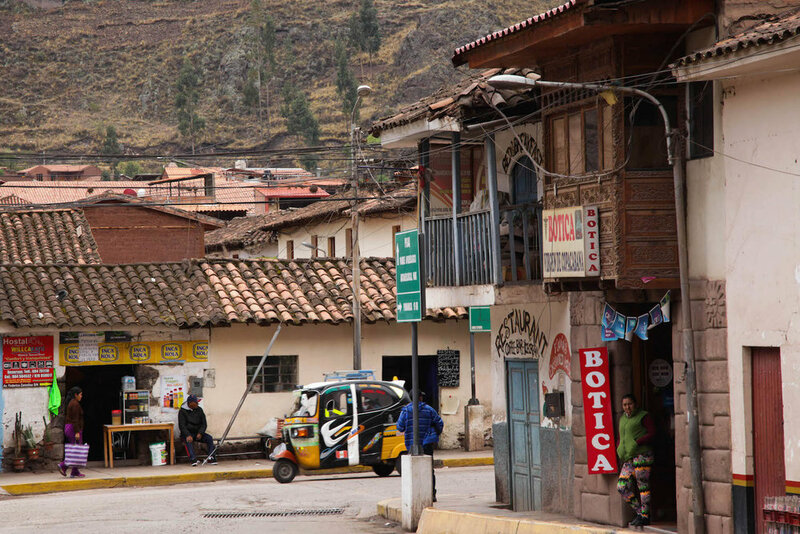 Finally, after another night at high altitude in La Paz, we took a third flight to Cusco in Peru and then taxi to Pisac. All up it took around three days. It sounds exhausting, but when you are visiting a new continent for the first time, you have that extra bit of gas. We enjoyed the ride. But that's not to say we didn't arrive in Pisac a little jittery. As it turned out our first mountain taxi journey - one hour from Cusco to Pisac - was also our most reckless. The diver liked to take those high mountain corners fast. Fortunately, subsequent drivers were more sedate. 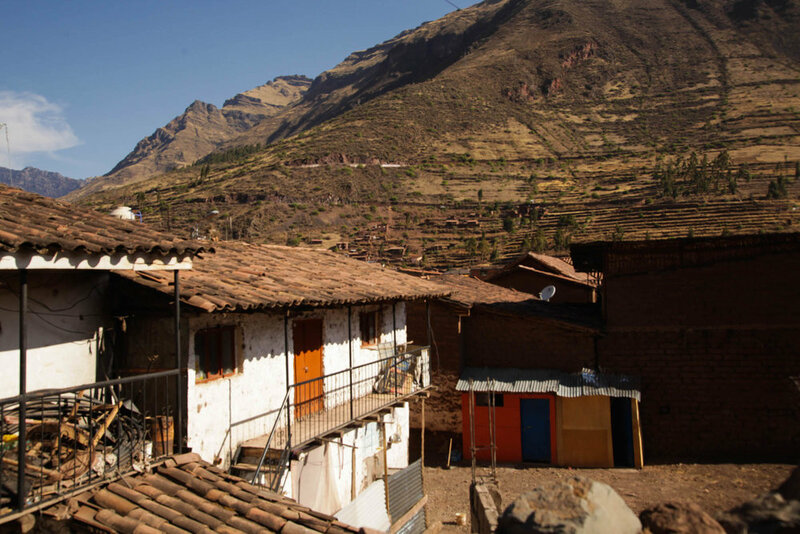 Pisac is a small sleepy town in the Sacred Valley of the Incas, spread along the edge of the Urubamba river. We stayed a couple of miles up a dirt track (accessed either on foot or via mototaxi) at the Casa Del Conde hotel - a very comfortable place with nice gardens. Not cheap but recommended. 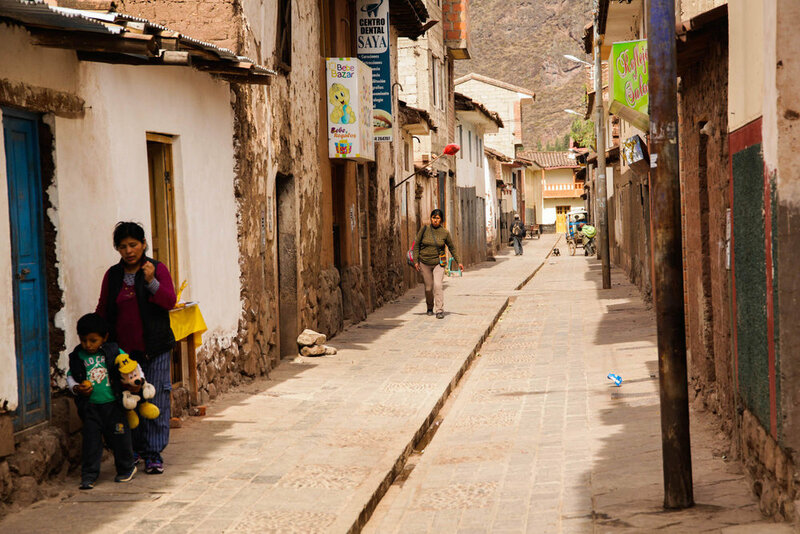 There isn't a lot to do in Pisac town except explore the narrow streets and visit the market in the main square. While the market is aimed at tour groups - who are unloaded by large busses that squeeze down the alleyways - it is still has a lot of incredible weaving and handicrafts. Spend some time and you will figure out that the further you venture into the market, the cheaper the prices. Fortunately, it isn't hard to get away from the tour groups. We wandered the backstreets to find the interesting stuff; crumbling old houses; snoozing dogs and locals going about their business as they always have done. 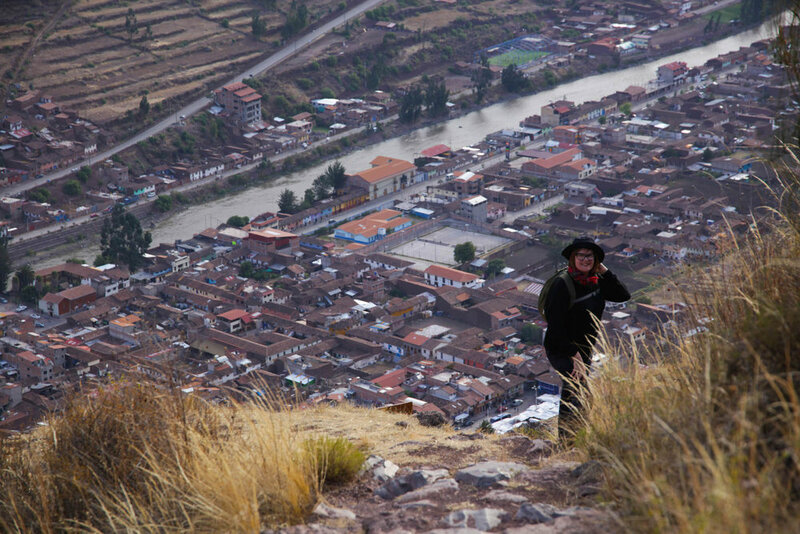 Up on the hill behind Pisac are the Inca ruins. Unlike Machu Picchu or Ollantaytambo, these are sparsely visited, which is reason enough to visit them. They are also spectacularly spread across several hills and ridges and it is a great walk from the top to bottom. Hardy and thrifty visitors walk up and down all the way from Pisac, but we took the easier route and Taxied up then walked down. Taking our time, this still took around four hours. On the way up we bought our Boleto Turistico which allows entry to most of the ruins in the Sacred Valley. 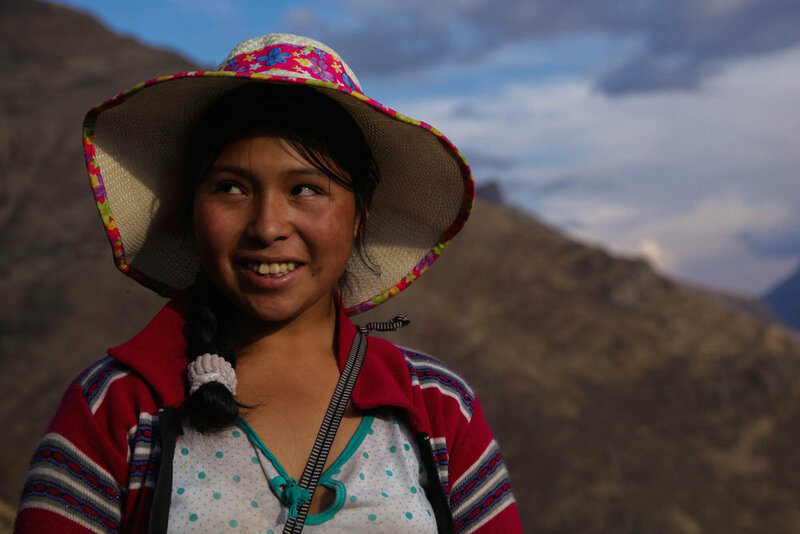 The below video shows some highlights from our visit to Pisac, as well as the journey to get there.